In Arizona, especially, it’s all about the rain. A rainy winter can produce lush and showy wildflowers. A dry winter… well, just the opposite. No matter how much water comes to the desert, you will most always find beautiful displays of flowering cacti. Some bloom in the Spring and some in the Summer. We have selected these websites as the best for wildflower information. Travel with us to view wildflowers in the desert near Phoenix. From the site, Desert USA, a great Arizona Wildflower report and flower photos. The Arizona-Sonora Desert Museum keeps in touch with Tucson area wildflower sightings. Their websitehas a great comparision between the 2007 season and 2008 season. 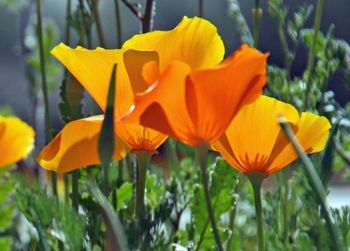 Judy Hedding has put together a great photo gallery of Arizona wildflowers. You can even send an e-postcard! Judy also has an informative article on wildflower photography. It's a quick read with some great tips. And, who isn't tempted to snap a few pictures of wildflowers? Picacho Peak – Picacho Peak State Park is 60 miles south of Phoenix. White Tank Mountain Regional Park- Fondly known as The White Tanks, this desert park is home to some beautiful Arizona wildflowers. You will find the park just west of Phoenix. Boyce Thompson Arboretum and Surrounding Areas- The Arboretum is located at Highway 60 milepost #223 near the town of Superior, 55 miles due east of Phoenix or two hours drive from downtown Tucson via highways 79 and 60. Desert Botanical Garden- The Desert Botanical Garden, in east Phoenix, usually has a nice spring display of wildflowers along the trails. They spring butterfly display is a spectacular and educational thing to see. Make sure you bring your camera! Arizona's State flower is the Saguaro Cactus Blossom. The American Meadows wildflower seed website describes the Saguaro. The Saguaro, or Giant Cactus, is the largest cactus in the United States, occasionally attaining a height of more than 50 feet and developing as many as 50 arms. Large individuals are believed to be from 150 to 200 years old. The Saguaro has contributed substantially toward the subsistence of Arizona's Pima and Papago Indians, furnishing materials for food and shelter. In spring, delicate white flowers with yellow centers and a brilliant satiny sheen bloom on the tips of the Saguaro's upward-curving branches and stem. In 1992 when the wildflower series of U.S. stamps was issued, the Desert Five Spot flower was featured for Arizona. In general the wildflower season in New Mexico runs from February to April. However there are climate zones within New Mexico that run from desert to mountain environments. You will enjoy a variation in wildflowers depending on the altitude of the area you are visiting. Just as with any mountainous area, wildflowers abound in summer. At lower elevations, spring is wildflower time. A photographic field guide of New Mexico mountain wildflowers and desert wildflowers will help you identify the flowers you see in New Mexico. Cloudcroft - The Cloudcroft Chamber of Commerce touts high mountain meadows and cool air as a welcome relief from the surrounding desert. Warm summer days are sprinkled with mountain showers that come and go quickly but which leave behind a variety of wildflowers that blanket the meadow and line the roads. Summer temperatures reach the upper 70’s but the nighttime lows remain in the cool 40’s and 50’s. Cloudcroft New Mexico is located on U.S. Hwy. 82 and is easily accessible from both east and west. The western approach from Alamogordo (north of El Paso, Texas, on U.S Hwy 54) is a steep 16 mile climb of nearly 5,000 vertical feet that takes travelers through a variety of climate zones. Organ Mountains of New Mexico - This strikingly beautiful photographic website features flowers from the Organ Mountains. Bosque de Apache Wildlife Refuge - The Refuge is not only a wonderful place to see wildflowers in season, it is one of the most spectacular national wildlife refuges in North America. Here, tens of thousands of birds--including sandhill cranes, Arctic geese, and many kinds of ducks--gather each autumn and stay through the winter. Feeding snow geese erupt in explosions of wings when frightened by a stalking coyote, and at dusk, flight after flight of geese and cranes return to roost in the marshes. New Mexico's State flower is the Yucca Flower. In 1992 when the wildflower series of U.S. stamps was issued, the Claret Cup Cactus flower was featured for New Mexico. Utah is yet another state with diverse environments. There are mountains and deserts. Depending on the elevation wildflower season may be Spring or Summer. Zion National Park - Although Fall is my favorite season for visiting Zion, the park, with adequate rain, can erupt in wildflowers. Watch the Zion website for announcements. Zion is an ancient Hebrew word meaning a place of refuge or sanctuary. Protected within the park's 229 square miles is a dramatic landscape of sculptured canyons and soaring cliffs. Zion is located at the junction of the Colorado Plateau, Great Basin and Mojave Desert provinces. This unique geography and the variety of life zones within the park make Zion significant as a place of unusual plant and animal diversity. Bryce Canyon - June is the best time for Bryce Canyon since it is a little higher in elevation. Utah's State flower is the Sego Lily. In 1992 when the wildflower series of U.S. stamps was issued, the Sego Lily was featured for Utah. According to the American Meadows website, The Sego Lily has been in favor since the days of the early Mormon pioneers. They found, from the Ute Indians, the bulblike roots of the plant were a satisfactory addition to their dwindling food supply. The Sego Lily grows from a short bulblike fleshy stem called a corm, which grows underground. The plant’s few bluish-green leaves are long and narrow. The flowers are about two inches across, and two or three of them may be borne on the stiff slender stem. Its lovely hues and markings have earned this lily the name mariposa, a Spanish word meaning butterfly. Visit during July in beautiful Crested Butte for a week of botanical celebration! Bring your family and together you will have an unforgettable experience: enjoy breathtaking mountain landscapes and magnificent native flora that prompted the 1989 designation by the Colorado Legislature as the Wildflower Capital of Colorado. In this beautiful high country, blossoms start to emerge in mid-June and last through September, though the peak of the wildflower season is generally acknowledged to be the third week in July. When wildlfower season is over, beautiful berries dot the high country. Great web site for the identification and appreciation of mountain and desert plants in the Four Corners area of Colorado, New Mexico, Arizona, and Utah. These Colorado wildflower pictures are arranged by flower color. The scientific name of the plant is listed underneath its picture. Visit the twenty-one parks throughout the state that are highlighted in the Tour de Fleur, a wildflower tour of Colorado State Parks. See the vibrant colors of spring and catch a glimpse of the featured flowers-Colorado Columbine, Mule's Ear, Pasque Flower, Penstemon, Prickly Pear Cactus, Scarlet Paintbrush, Sego Lily and Shooting Star. These flowers are also depicted on the wildflower bookmarks that can be collected at each park on the Tour de Fleur. Colorado's State flower is the Rocky Mountain Columbine. However, in 1982 when the wildflower series of U.S. stamps was issued, the Moss Campion was featured for Colorado. According to the American Meadows website, as legend has it, long ago in Rome when someone saw the quaintly-shaped, five-spurred Columbine, his lively imagination pictured five little doves perched on the rim of a dish feeding together, so he named the flower columbina, from the Latin columba, meaning "dove." The five petals form funnels, each ending in a slender, upward-curving spur. So You Want to Cut Your Own Christmas Tree in Arizona? What Are the Best Spas in Scottsdale, Arizona?